There are many skills influencing handwriting for kids. 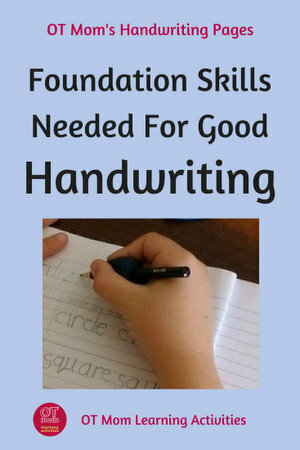 This page will help you understand all the different foundation skills that can affect your child's handwriting abilities. Even in this age of technology, reading and marking a child's handwritten work is still (often unfairly) the primary way that elementary teachers figure out what their pupils know. Kids with poor handwriting may be at a disadvantage when a teacher marks their written work. They may also struggle to write creatively or even to write down answers correctly, as it takes all their concentration and effort to just get ANYTHING down on paper. When kids struggle to write neatly and efficiently, they are often accused of being lazy, and this may affect their behavior and self esteem. In high school years, kids who struggle with handwriting may suffer even more as they struggle to keep up with the volume of written work required. As with all my pages, this information is NOT a substitute for occupational therapy. It is intended to inform and to guide normal development. Please speak to an occupational therapist if you are concerned about your child's progress. Click on the links to jump to the relevant sections on this page! Visual-Motor Integration (VMI) enables the hands to correctly replicate what the eyes see. Visual perception and fine motor abilities are integrated in this skill, to enable the child to copy shapes, numbers and letters. Children need to be able to copy basic shapes – such as diagonal lines, circles, squares, triangles and intersecting lines before learning to form their letters correctly. Visual-Motor Integration and specific Fine Motor skills have found by various studies to have the biggest effect on handwriting for kids. Provide lots of opportunities to trace and draw shapes and simple drawings in early childhood BEFORE letters are introduced. Let your child trace over your shapes in sand, or with chalk on a board before trying to draw the shapes on their own. Work on visual perceptual skills and fine motor skills to strengthen those foundations. 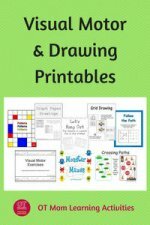 Older kids can benefit from grid drawings to strengthen their visual motor skills. 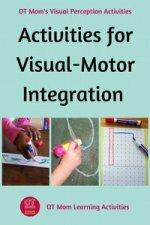 Check out my visual-motor integration activities for kids of all ages. When fine motor skills are poor, handwriting is often affected. However, the actual pencil grip could be less important than we think: handwriting is more affected by the child’s ability to manipulate or control the pencil. In-hand manipulation (dexterity) and finger skills have been shown to have the most impact on handwriting for kids. A poor sitting posture will also affect handwriting in kids, as the smaller muscles of the hands are not freed up to work properly! 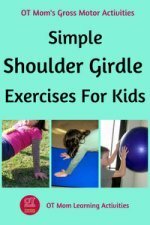 Work on core muscles and shoulder muscles so that the hands and fingers will be able to move more freely and accurately. Climbing on jungle gyms gives these muscles a good workout - encourage your child to climb and clamber as much as possible. Work on hand and finger skills from an early age. Encourage lots of scissor cutting, playdough play and playing with lego. Encourage your child to spend less time on electronic devices and more time on gross motor and fine motor activities to build these skills. Computer games don't help develop the in-hand manipulation and finger skills that are needed for kids' handwriting! 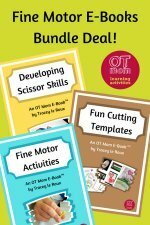 For more ideas, check out my downloadable fine motor e-books. The seemingly innocuous ability to play with bats and balls can affect handwriting for kids. Children need eye-hand coordination to guide their pencil between the lines and ensure their letters don’t go over the lines or touch each other. Messy writing could therefore be a result of poor eye-hand coordination! 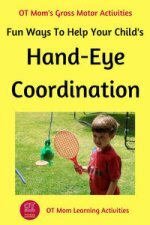 Help your child develop this skill with lots of gross motor hand-eye exercises.Play bean bag games, ball tossing games, and bat and ball games as much as possible. 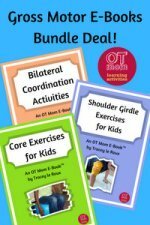 If your child struggles, check out the pages on coordination on my site for some activity ideas. Encourage your child to thread beads and do lacing cards. Playing with Lego and other types of building blocks also encourages eye-hand coordination. You can get some more ideas here. Look for worksheets and activity books that have mazes and follow-the-path pictures. Working on ocular motor skills such as visual tracking can also help develop hand-eye coordination skills. Spatial perceptual skills can affect a child's ability to lay work out well on the page and can make their handwriting look messy. Letters may be irregularly sized, or the child may struggle to use the lines properly, writing with haphazard sizing and spacing. This is common in children who are still learning to write, but may signify a problem by the second and third grade. Older children may need to learn compensatory strategies instead. These may include specially lined paper, sticks to help with spacing and frequent cueing. Directionality and problems with left-right discrimination can affect letter reversals and transcription (writing "saw" as "was"), as well as starting on the wrong side of the page or writing in the wrong direction. A good sense of direction develops from a good personal spatial relationships, but starting on the wrong side of the paper can also be caused by midline crossing issues. Help your child get a good sense of direction with games that use space, and space words, such as forwards, backwards, up and down, under and over. 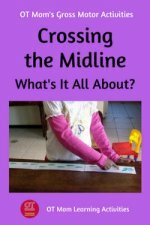 Work on midline crossing with some fun activities that get your child reaching over to the opposite side of the body with each hand. Once general space concepts are established, work on left and right. This can take some time. It may help your child to hold a beanbag in the right hand during those games, to help the brain to register that the right side is different to the left in a sensory way. This often works better than putting a dot on the hand, as the child has to stop and look at the dot to remember which hand is which; but with a weighted object in one hand, it FEELS different. Remember to use the same hand each time - preferably the dominant hand. Getting good tactile (touch) feedback, as well as proprioceptive and kinesthetic feedback from the hands and joints plays an important role in helping develop good handwriting for kids. Kids who struggle with these skills may hold the pencil too tightly, or press too hard on the paper when writing. Sometimes they may scribble "uncontrollably" to give themselves proprioceptive feedback, much to the frustration of their teacher! They may also feel the need to keep their heads close to their work to watch while they write, trying to get as much visual feedback as possible to compensate for their poor sensory feedback. 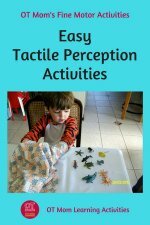 Try some tactile perception activities to help develop good touch perception. Hide some toy animals in a cloth bag and have your child identify the animal by feel. You can also use household objects for younger kids. Playing with playdough can give the hands lots of proprioceptive feedback - encourage your child to knead, pound, and pull off blobs of playdough to give the hands a good workout. Orthographic coding skills enable a child to remember what a word or letter looks like, and then to write it down as needed. Children with poor orthographic coding skills easily forget how a letter is formed and may thus form it differently each time they write it, even writing it different ways within the same writing task! Or they may retrace parts of the letter trying to figure out where the next part goes. This can cause their handwriting to look untidy. Remembering how to form a letter! Kids with poor orthographic coding may struggle to figure out where to start the letter, and may hesitate a lot while writing. They take a long time to put their thoughts on the page as they are just trying to figure out where to start to form the letters or how to write the word. Orthographic coding delays may affect reading and spelling as well as handwriting skills. Teaching correct letter formations from an early age may help reduce later problems. Start with the letters of the child's name and later teach letters in order of similar formation (eg c, a, d, g, o, q). It is never too early to learn to form the letters correctly! Just as you would encourage your child to practice kicking a ball or building a tower, show the same patience and creativity in practicing letters correctly. Make it fun and interesting, but don't force young kids to write if they are not interested. 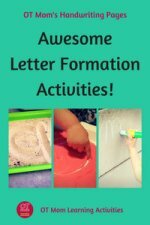 Try these fun letter formation activities, or check out my tips and strategies for kids who are struggling. Use verbal cues (such as rhymes that reinforce the formation of the letters). Look for programs like Handwriting Heroes that use rhymes, stories and visuals to help kids master letter formations. Ask your child to try writing the letter in the air with eyes closed. Watch carefully and you will get a good sense of whether the correct formation has been internalized. You can also work on visual memory skills with games like Concentration and include memory exercises in letter formations as well. Have them look at a letter, trace it with a finger, cover it up, picture it in their mind’s eye, trace it in the air and then check, trace it again and then write. Older kids may benefit from a letter chart on their desk, along with arrows indicating starting point and initial direction. 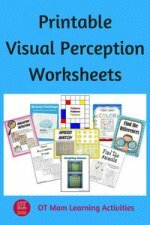 Visual perception enables kids to understand what they see. This can affect handwriting for kids in subtle ways. A child with poor visual discrimination skills may not see that writing an “r” is different to writing and “n” or a “h”. And this may be reflected in a child's handwriting, where those letters all look the same! A child with poor visual closure skills may not realize that an “o” which is not closed properly looks like “u”, and this would affect their letter formations. 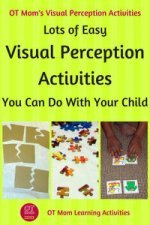 Incorporate visual perceptual games and activities into your family life. Try Waldo books, "Seek and Find" books and plan regular jigsaw puzzle sessions as a family. Encourage your child to pay attention visually by finding items in picture books, finding specific groceries on a shopping advertisement, and looking at "spot the difference" pictures. A lesson in handwriting for kids with poor motor planning skills, is like a brand new lesson for them each time – they can really struggle to carry over what they have learned in previous lessons. You may also see the child with poor motor planning skills struggling with other classroom tasks, like figuring out how to use a ruler to draw a line, figuring out how to cut around a complex shape with scissors, etc. Kids with poor motor planning skills can benefit from lots of sensory and movement input to help their brains develop sensory-motor maps of movements. They also benefit from learning strategy through games such as obstacle courses and strategic board games – they may need to be patiently taught the strategies of each game. However, in the classroom, these children need accommodations to help them work AROUND their problems. An occupational therapist will help analyze your child's specific challenges and then provide "just right" recommendations to help your child. 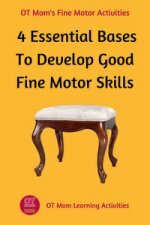 Addressing each individual challenge they face can help their overall motor planning delays and may help improve their handwriting in the long run. Each child has inherent mental and intellectual abilities – these inherent abilities will affect their ability to learn handwriting skills. It is beyond the scope of this website to address these issues. Organization and problem solving skills include motor planning and the spatial perceptual ability to lay work out well on the page. Kids' handwriting skills may be affected as a result of general disorganization and failure to understand and follow instructions. Problem solving games such as Rush Hour as well as spatial perceptual games such as Tangrams, can help a child develop organization and problem solving skills. Clicking on the images above will take you to those products on Amazon so you can see what I'm talking about! Play listen-and-do games, where your child has to respond to instructions given. Older children may need to learn compensatory strategies instead in order to deal with the immediate classroom demands. 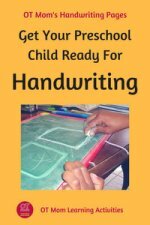 Kids in preschool and kindergarten need to work on the underlying foundations for handwriting. 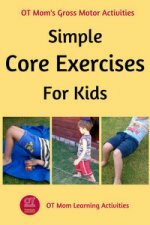 These pages on my site will give you tips and activity ideas to help build their skills. 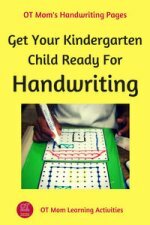 If your child is older than elementary age, you may want to check out my page about handwriting for kids who are in the higher grades. 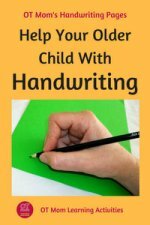 It is not always easy to help with handwriting for kids who are already well established in their habits, but if you have a motivated child and an encouraging adult, there are some steps you can take to help support handwriting skills. I hope you found this page useful in helping you to understand the different foundation skills involved in handwriting for kids! If so, please like and share my page to enable more people to be helped! Below is a gallery of the different pages on my site that were referred to in this article - feel free to browse and dig deeper! Thanks for visiting! Tennyson, J. Effective Occupational Therapy Intervention For Handwriting/Fine Motor Difficulties, Master's Thesis, Humboldt Stae University, 2006. Article can be viewed here.